What’s The Difference Between Etched Glass And Carved Glass? We are often asked to explain the difference between etched glass and carved glass. Both types are created using the same sandblasting equipment and techniques however the carving process goes much deeper into the glass to create multiple depths and sculptural relief effects. Carving glass enables our artists to add a 2-dimensional pattern (similar to etching) while at the same time adding a 3-dimensional texture to the glass. The visual effect of a carved glass design is nothing short of stunning. 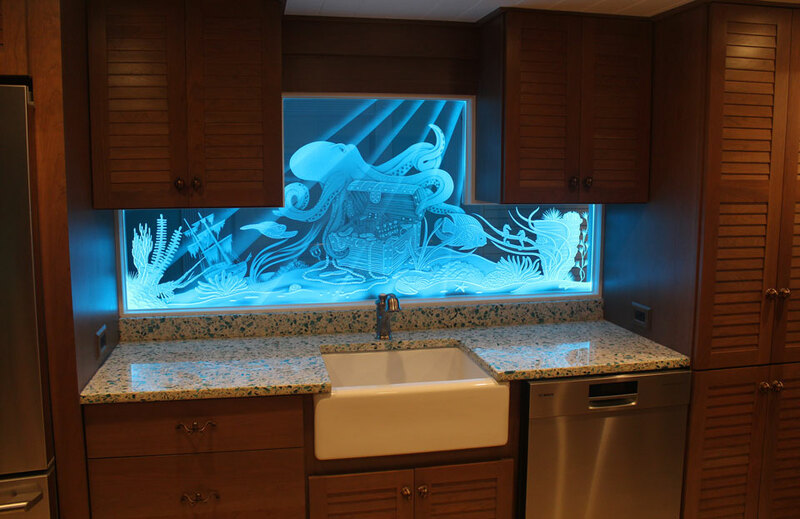 The major difference between Etched & Sandblasted and Carved Glass & Airbrushed Glass is the addition of vivid color. After the glass has been carved, the etched surfaces are colorized using a wide-range of color dyes and precision air brushing equipment to enhance the sculptural effect by adding shadows and realistic color highlights to bring the airbrush glass design to life. The color dyes can be translucent or solid with a shiny, matte, or metallic finish depending on the effect the design calls for. As always, we start with a consultation between our artists and our client to determine what the scope of the project is, the physical size and the intended use. For example will it be a bathroom enclosure, a front entryway, cabinet doors, a tabletop, interior doors, a freestanding room divider, a partition wall, to name just a few possibilities. We have hundreds of examples and design drawings to look at, all you have to do is tell us what you like (and what you don’t like) and our skilled artists will create a custom design just for you. Once we have an approval for the design we use a rubber masking material to cover the entire surface of the glass. Then the design is transferred to this rubber mask and meticulously hand cut by our skilled artists to expose the sections of the glass that will be sandblasted and carved. The masked glass panel is placed inside our sealed etching room where we use our high-pressure blasting tools to blow an abrasive onto the exposed areas of the glass. At first the abrasive etches into the glass rendering an opaque or translucent surface. Then the artist will adjust the air pressure and vary the blasting time in specific areas to create the carving effect. Some sections may only be a lightly etched, other areas will be carved a little while others will be carved quite deeply. This sculptural carving technique requires practice, a lot of patients and skilled coordination to bring out the shadows and fine details that will ultimately achieve an impressive 3D effect. When the etching artist has finished the carving process the next step is to add the airbrushed color. The airbrush glass paint colors are custom blended to achieve the desired effect then the airbrush is loaded and the color is sprayed onto the glass to bring the pattern or image to life. The paint is allowed to dry for a period of time then a clear sealer is added to fix and protect the color layer. Antiqur Mirror New York offers a full spectrum of Custom Carved & Airbrush Glass. Please visit our website, http://www.giovaniglass.com/ to view our work in the Etched & Sandblasted Gallery. Then call us today at 718-600-2294 and allow me, to help you develop the look you’ve always wanted.